YouTube has gone from strength to strength in 2015 – generating billions of video views each day, and reporting a 60 percent increase in watch time in comparison to last year. Sitting at the top of the millions of videos posted in 2015 are the top 10 most watched videos uploaded this year. YouTube’s list splits out music videos from other clips, but if it didn’t, Wiz Khalifa’s See You Again would be sitting at the top of the list with 1.2 billion views and counting since April. The next most popular music videos are Maroon 5 with Sugar, and the official video for Major Lazer & DJ Snake’s Lean On (feat. MØ), which have had 910 million and 875 million views respectively. The most watched non-music video (sort of) posted this year is Silento – Watch Me (Whip/Nae Nae) by Tianne King, which has had nearly 116 million views since it was posted in April. The Clash of Clans :Revenge official Super Bowl TV commercial takes second spot with 83 million views. That’s pretty good going for a single ad. The third spot goes to potentially the best dad ever RomanAtwood and his Crazy Plastic Ball PRANK, which has managed nearly 56 million views. While ‘worthy’ videos often don’t get the views they deserve, Love Has No Labels by Ad Council didn’t suffer this fate, notching up 55.1 million views. The fifth spot has garnered 54 million views and goes to the first clip from a major mainstream late night TV show, in this case The Tonight Show’s Lip Sync Battle with Will Ferrell, Kevin Hart and Jimmy Fallon. Justin Bieber’s Carpool Karaoke by The Late Late Show with James Corden is following hot on the heels of The Tonight Show with 43 million views in sixth place. 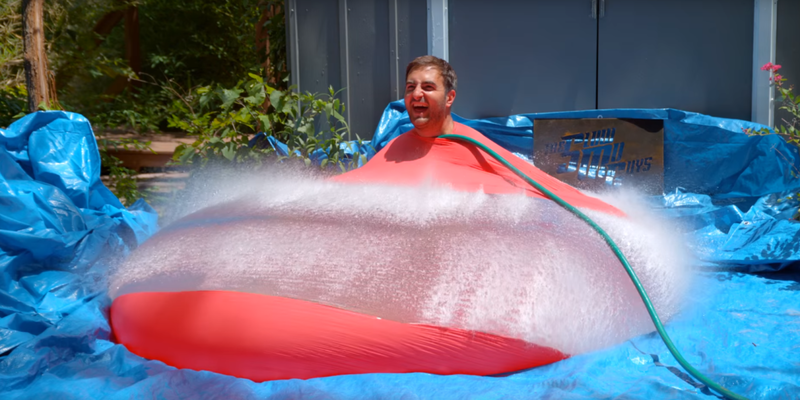 Who can resist a clip of a 6ft Man in a Giant 6ft Water Balloon exploding in high-res 4K, slow-motion courtesy of The Slow Mo Guys? 40 million of you couldn’t. The eighth spot goes is another to go to a clip taken from a mainstream TV show, this time from Britain’s Got Talent with Golden boy Calum Scott hits the right note, which 38 million people have watched. An unlikely candidate in the form of the Dover Police were responsible for the ninth most popular video of the year (and my personal favorite from the list) with Dover Police DashCam Confessional (Shake it Off). And rounding off the top 10 most popular videos of 2015 was Mean Tweets – President Obama Edition by Jimmy Kimmel Live.